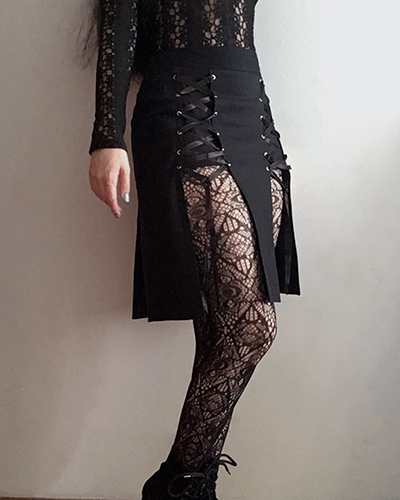 Laced skirt ELEKTRA is a completely free digital pattern for you to play with and explore your creativity! Pattern is made out of 7 pattern pieces per side. However, -1-, -2- and -6- are cut on fold of the fabric. Modesty mini skirt front piece -1- is optional. Skip it to create a very “risky” look! Waistband is patterned into the skirt, don’t leave it out! 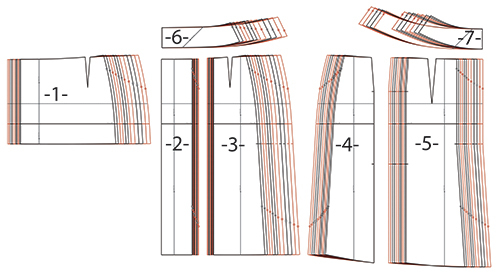 Lengthen or shorten pattern pieces -2-, -3-, -4- and -5- to easily create a different design. Adjust skirts length by measuring from the hip circumference line. To locate the waist circumference line, measure the top edge of pieces -6- and -7-. 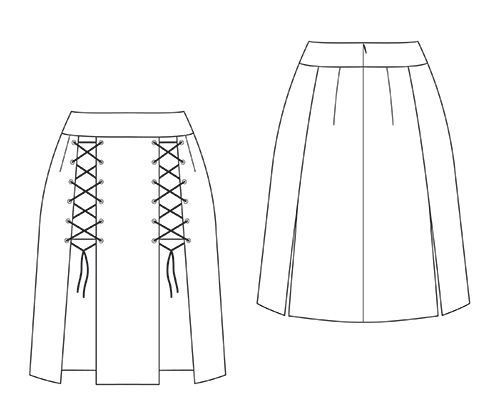 Download this pattern to receive the Laced Skirt ELEKTRA ready to be printed on Letter and A4 paper format. Your download file also contains a short set of instructions on how to measure yourself, how to pick a size and how to print this pattern. You can make and sell as many skirts as you like by using this pattern. How was the example Elektra laced skirt made? For the construction of example laced skirt Elektra, black cotton twill is used as its outside layer. But the skirt is lined with slippery black rayon lining. This complicated the sewing process though it made the garment much more comfortable to wear. Also, this double layer method called for the modesty mini skirt not to be attached to the side seams of the rest of the skirt. Skirt opening is finished with a black hidden/invisible zipper. To make it easier to pull the zipper, a small frog hook is sewn on to the edge of the waistband. Grommets/eyelets used are two part and very smooth as to avoid metal catching on anything. With 12 holes per slit, I believe I’ve achieved a decent balance between too many and not enough. Double sided black satin ribbon is used to tied the holes together. Similarly, any type of cord or ribbon should work just fine. Pattern is originally drafted using Metric values! Imperial values have been converted and rounded up, making the values in Inches approximations. Hip circumference heights are clearly marked on all pattern pieces making it easier for you to adjust. Check out my pattern adjustment/grading tutorials HERE for more info on how to alter these patterns for a better fit. Pattern does not include seam allowancer or any sewing instructions! Sew a sloper, mock up or a toile before using “good” fabric to test the patterns size and fit. I wish you the best of luck in tackling this project! Follow me on social media for more details. Take a look behind the scenes on current and future projects!